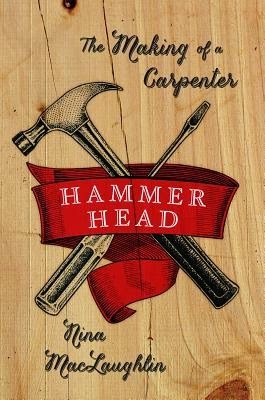 I'm not a big memoir reader, but I'm glad I made an exception for Hammer Head: The Making of a Carpenter. Nina MacLaughlin's reflections on quitting her job in journalism and becoming a carpenter's apprentice are captivating and interesting, peppered with anecdote and job details and the history of obscure tools and etymologies. And as if that's not enough, she also manages to include references to literary works young and old: Ovid and Joan Didion and Greek myths live side by side with stories of built-in bookshelves and learning to cut tile and laying flooring. The range of topics MacLaughlin has packed into a relatively slim volume is impressive. The screen exerts an oppressive power, and I am as seduced as anyone by the clips and pics, the news and noise of the Internet. I would rather e-mail than talk on the phone. I have pals I know only nline and am grateful for those connections. But there is no other place I can think of where one can consume so much and absorb so little. The Internet has no equal in that regard. I am leery of its sirensong, the way it beckons, and of my own inability to ignore its call. It's a rabbit-hole exit, a tumbling in space with Wonderland ever always one click away. The newspaper taught me what rote was. Sitting at my desk in the newsroom, fingertips tip-tapping, click-clicking, the dull glow of the screen reflecting off the pale skin of my cheeks, my glazed eyes, I'd felt a brain-dulled mechanization, action without thought, action without meaning or purpose. But here, with the tiles, each one had its place, part of the whole, each measurement had a purpose, each cut. There was no slumped semi-consciousness. It was repetitive, yes, but somehow not boring. She talks about the "'perversity of inanimate objects,'" a phrase from her grandmother referring to uncooperative jar lids and screws and doors that won't close properly: "moments when the dumbness of things outdoes your ability to calmly deal with them." We've all been there; it's nice to see that frustration reflected in someone else's words. Anger had cleaned me out. The hangover from it, the aftermath of all that frustration and embarassment, left me feeling unfamiliar with myself. I hated Mary a few minutes ago. I regretted every decision I'd made a few minutes ago. What a potent intoxicant, anger. This wasn't the truth, was it? It wasn't until after I left my job at the newspaper that I realized how significant a part of my identity working there had become; it was how I understood myself and made myself understood to other people. What am I now? I wondered, jobless. Fallow periods are something to savor. Times of low productivity can be one of life's luxuries. Thought there might be no outward proof of action or making--nothing written, nothing built--such time is hardly wasted; puzzles are explored and problems solved in the head. MacLaughlin is a strong writer (not surprising, given her background as a journalist) and has written a strong book (also not surprising, considering her journalism work included book reviews). Through the lens of her own experience, she encourages us to consider how we decide what is right for us, in the end, and how we want to spend our time. Never prescriptive, Hammer Head is instead a reminder, simply, to give it some thought. Copy from my public library. Ooh! I already wanted to read this (I love memoirs) and now you've shot it up towards the top of my TBR list! Thanks! I hope you like it! As a twenty-something myself at the tail end of my own "oh my god I need a new career" moment, it hit a lot of chords--but even if that's not the case, MacLaughlin is a good writer with great stories and lots of interesting thoughts about working hard and feeling the reward of that. Wow, just wow. I'd heard about this one in a couple places and, while her experience sounded totally unique and interesting, I wasn't sure if I wanted to read a whole book on it. But, the writing! Its gorgeous. Adding to my "Nonfiction November possibilities" TBR. And - I've definitely had the "I cannot be in this career one more minute" moment more than once...and switched careers multiple times before throwing my hands in the air and becoming a stay at home mom (where I discovered that book blogging is actually the "career" I was meant to have...it just doesn't pay so well). I was on the fence, but since it was short (it's only ~240 pages, and they are generously margin-ed), I figured I'd give it a try--so glad I did! She's a great writer, and includes enough non-carpentry topics to keep it from ever feeling dry (or confusing, to those of us (me!) who know not a thing about carpentry or building). I hope it fits into your NonFic November plans! YES. I just finished this book today and I loved it. I'm about to graduate from college and I'm having crushing doubt about whether or not I want to continue doing what I've been studying for 4 years. So this book came at just the right time for me. And that quote about not working (which I also highlighted) made me feel much better about potentially going home for the summer to save up money before going back out in to the big scary world. I loved her writing, it was such a delight to read! That was what attracted me to this in the first place--it's so unexpected for a career shift, and I love that.